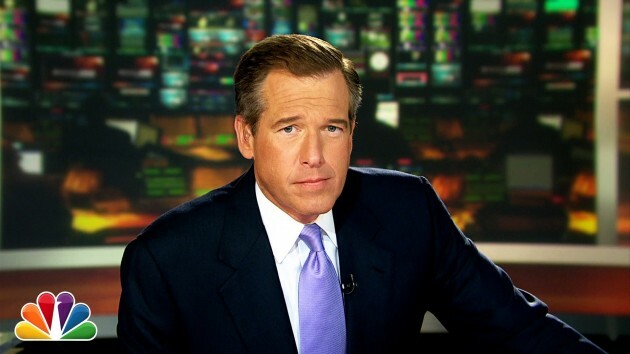 NBC Nightly News anchor Brian Williams has stepped down temporarily amid revelations he lied about being in a helicopter that took RPG and Ak-47 fire in Iraq back in 2003. Americans say NBC Nightly News anchor Brian Williams hurts the network’s credibility and think he should resign, according to a new survey from Rasmussen Reports. Williams was recently caught lying about a story he often repeated, which claimed the helicopter he was traveling in while covering the Iraq War in 2003 took RPG and AK-47 fire. Forty percent of American adults think Williams, who was once the poster boy for NBC News and the effort to marginalize alternative media, should resign because of his lie, while 35 percent disagree. A quarter of Americans (25 percent) say they aren’t sure yet. However, a sizable 40 percent now say they are “less likely” to trust the reporting on NBC News because of the lie Williams and the network frequently repeated, while only 8 percent (who are those people?) are more likely to believe NBC’s reporting. Still, 45 percent say the lie has no impact on their confidence in the network’s reporting. There is no doubt that Williams had a popular image among American adults and, according to the survey, his image hasn’t taken a complete turn for the worst, at least not yet. But the intensity index, or the spread between those who feel strongly one way or the other, is moving against him. Forty-three percent of Americans adults still have a favorable opinion of Brian Williams, though that includes just 13 percent who say they have a “very favorable” one. Meanwhile, 33 percent now view him unfavorably, which includes 18 percent who hold a “very unfavorable” view. Nearly a quarter — 24 percent — say they don’t enough about him to even offer a soft opinion. Twenty-eight percent (28%) also don’t know what they think of ABC-News anchor George Stephanopolous. Forty-five percent (45%) have a favorable view of the former senior Clinton administration official-turned-newsman, while 27% regard him unfavorably. This includes 13% with a Very Favorable opinion and 11% with a Very Unfavorable one. Scott Pelley is the evening anchor of the other of the big three traditional networks, CBS. Just 20% have a favorable view of Pelley, including five percent who see him Very Favorably. Eighteen percent (18%) share an unfavorable opinion, with seven percent (7%) who hold a Very Unfavorable one. A whopping 62% have no opinion of Pelley. The power of network news has waned significantly over the last decade, as has Americans’ faith in those institutions — a no doubt related finding. The most recent Gallup Confidence in Institutions Survey found the major network news stations, including NBC, ABC and CBS, are now less trusted by the American public than Internet news sites. Similar tracking by Rasmussen Reports show voters still consume TV news more than Internet news when it comes to politics, but the gap is narrowing quickly. However, much of that is not contributed to network news, as 69 percent watch cable news networks for political news, at least occasionally. Regardless of the source, voters are more skeptical about the political news they are getting than they have been in the past. Unsurprisingly, those who watch one of the traditional networks for news every day or nearly every day have a higher favorable opinion of Williams — 63 percent. That number is nearly identical to the views these particular American adults hold of Stephanopolous. Pelley, on the other hand, is far down the list even among frequent viewers. Further, these viewers are also the least likely to say the Williams lie makes NBC News a less credible source and most also do not feel Williams should resign as NBC’s evening news anchor. Fifty-eight percent of Republicans, 25 percent of Democrats and 40 percent of unaffiliated voters disagree. The national survey of 800 Adults was conducted on February 7-8, 2015 by Rasmussen Reports. The margin of sampling error is +/- 3.5 percentage points with a 95% level of confidence. Field work for all Rasmussen Reports surveys is conducted by Pulse Opinion Research, LLC. See methodology.